Bear insisted on the Wild Vegetable with Bean Curd and Celery. Possibly because it is in his diet to eat wild vegetables? Anyways, it was okay with lots of vegetable pungency and only mildly seasoned. The textures were good with a slight bite to go with the softness. 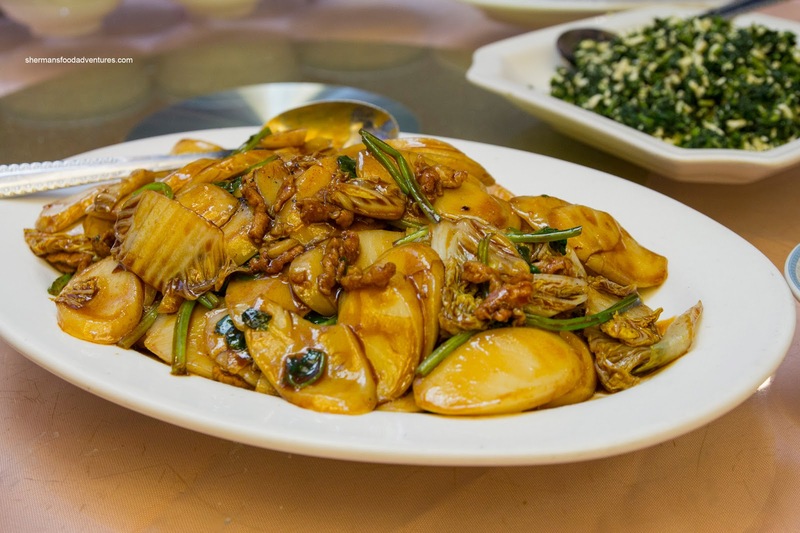 Onto a dish Miss Y had to get no matter what - Shanghai Stir-Fried Rice Cake. 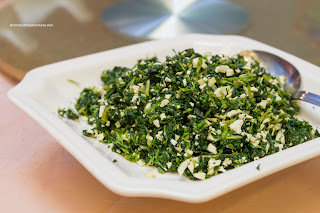 Arriving in an appealing rich colour, it was the beneficiary of good wok heat where the flavours caramelized. It was greasy as per usual, but not overly so. The sliced rice cake had its hallmark chewiness, yet was still soft to the chew. The accompanying Napa cabbage and spinach were still vibrant while the julienned pork was moist. 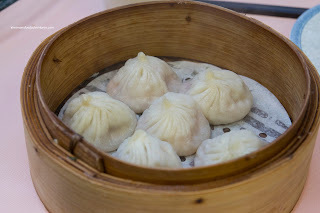 We ended up with 3 orders of the Xiao Long Bao because we had 8 people as Dark Helmet caught wind of our eating adventure and ended up crashing our dinner. Hey, whatever Dark Helmet wants, he gets. We don't want to face his Schwartz! We found the dumpling skin to be on the thicker side, but it wasn't tough. The amount of soup was decent and full of sweetness with only a touch of xiaoshing wine. Not much in the way of ginger though. As for the meat, I thought it was too gritty with bits and pieces of cartilage. If it were ground up smoother and/or had more fat, the XLBs would've been that much better. 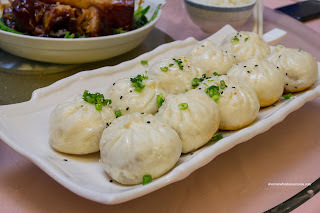 With the same filling, the Pan-Fried Pork Buns were pretty good. The bun itself was fluffy and light while the bottoms were crisped up golden brown. Yes, they were greasy, but that was alleviated by the proper preparation of the bun. There was a good amount of the same soup in the bun, but then again, the meat was too gritty. Heading into the meat of the meal, literally and figuratively, we had the Stewed Pork Knuckle on a bed of spinach. The meat ranged from fork tender to slightly dry, depending on the section. This was not a surprise as most versions of this dish have the same issue. The fat and skin were soft and gelatinous while the spinach was just barely cooked. Although the sauce was on the sweeter side, it was rich enough to have an impact on the meat. Moving onto the Lion's Head Meatballs, I was quite indifferent. 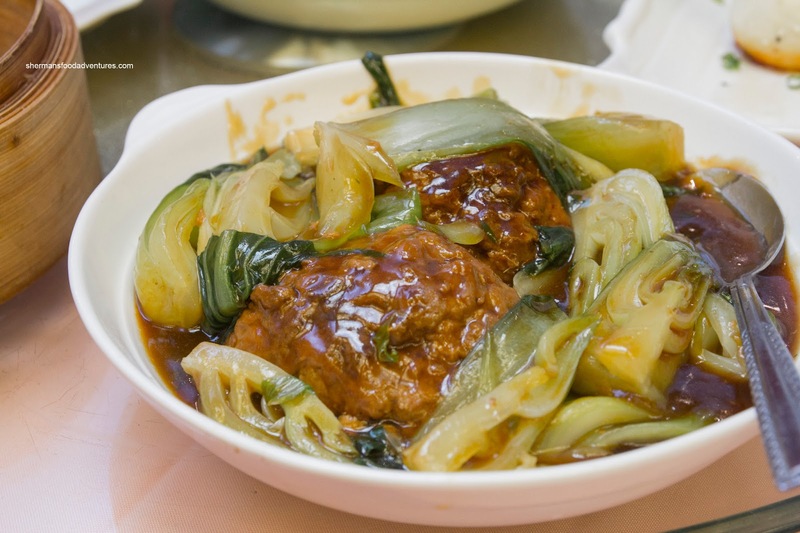 The meaty chunks of unprocessed meat was welcomed, but the binding ingredients (including the ground pork) was far too loose and soft. Hence, the meatballs were spongy and textureless. Flavourwise, there wasn't much of an issue as it was balanced. The accompanying Shanghai bok choy was seriously overcooked. We added 2 more dishes at the end including the Smoked Tea Duck which was fantastic. It was fried up beautifully with a crispy skin which gave way to moist, smoky meat. We thought the inclusion of only 6 clam-shaped mantou was a bit chintzy for the amount of duck. Miss Y went as far to ask me to take a picture of her "clam sandwich" where I almost choked on my duck... We also had the Dan Dan Noodles which had a combination of peanut sauce, pickled vegetables, ground pork and dried shrimp. This concoction was quite flavourful and aromatic. 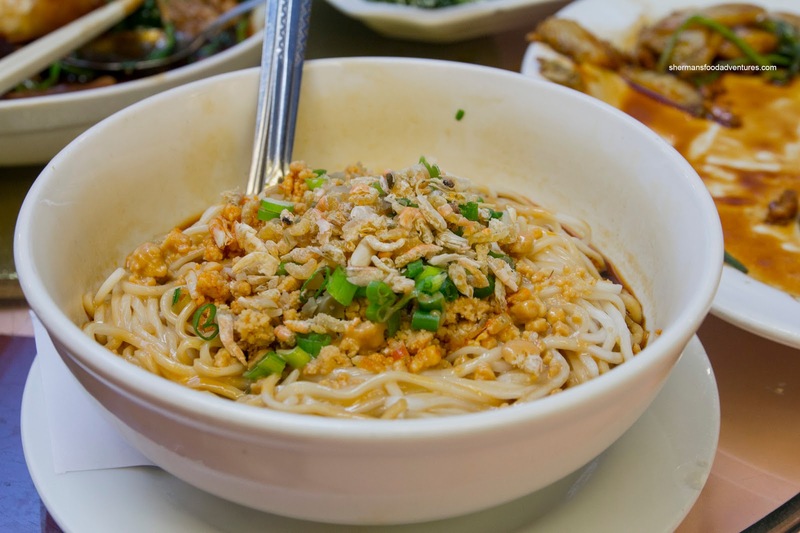 Again, there was a balance of flavours and when combined with the slightly soft noodles, it was a good eat. Despite some issues with meat textures, we felt the meal as a whole was more-than-acceptable. Of course, Shanghainese food in Richmond is competitive with many great restaurants, so Shanghai House is a decent option, but not the best one though. Shanghai House is pretty good, not stellar but quite consistent. XLBs are slightly above average. My parents like the "classy" interior, feels better than your average Chinese resto, if sometimes boisterous. Super excited my last Shanghai restaurant to try will be here and it sounds not bad :)! 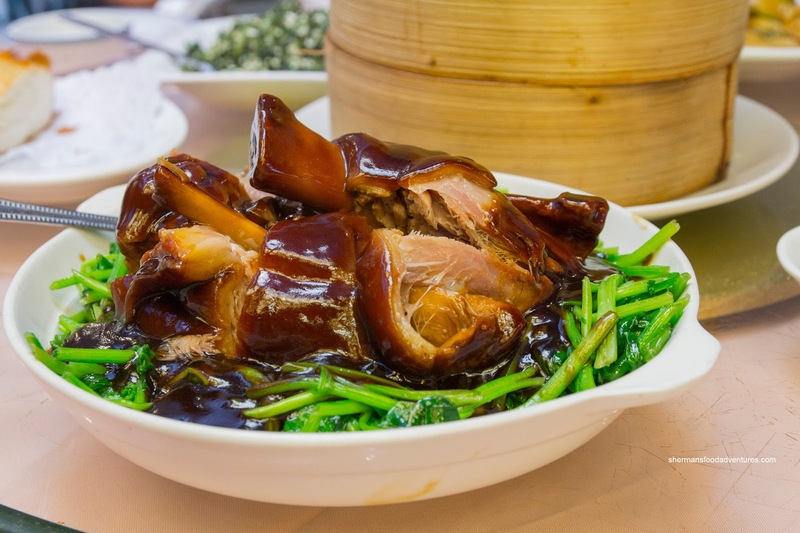 You should try Jin Jiang on Kingsway, the smoked duck is very juicy and melts in your mouth, I wonder if its better than Shanghai House. 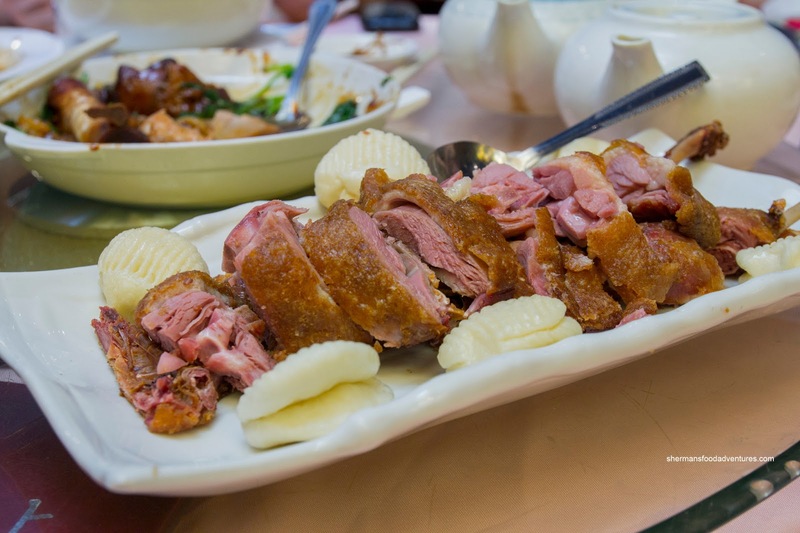 We were at Jin Jiang in BBY last week, the smoked duck was faaaaaantastic! crispy skin fried to perfection while the meat is juicy and flavourful. 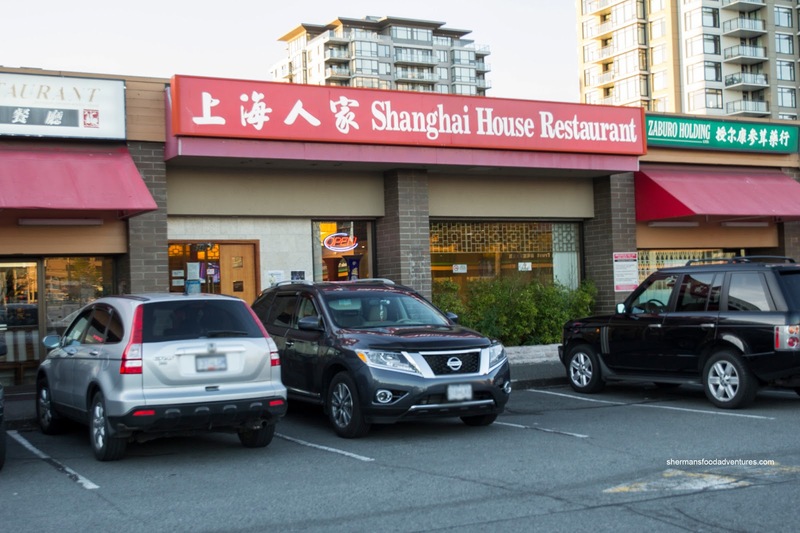 I would say they are one of the more authentic Shanghainese restaurants in the GVRD.